This survey of bankruptcy and insolvency case law is the third installment in this series, which was initiated in 2009 following Congress’s enactment of the Bankruptcy Abuse Prevention and Consumer Protection Act (“BAPCPA”) in 2005. The previous version of this article was published in 2012, not long after the Supreme Court’s 2011 ruling in Stern v. Marshall, which restricted the authority of bankruptcy courts to issue final judgments on issues arising under state law. As was noted in the 2012 installment, “[t]he full impact of Stern both nationally and in the Fourth Circuit remains to be seen.” There has been a significant amount of development concerning Stern claims both nationally and within the Fourth Circuit in the past three years. It is fitting that this installment should come on the heels of the Supreme Court’s decision in Wellness International Network, Ltd. v. Sharif, which has resolved many of the issues posed by Stern, at least for the time being. More generally, the Supreme Court has decided an abnormally large number of bankruptcy cases in the past few years. This article surveys recent significant developments in Virginia civil practice and procedure. The article discusses opinions of the Supreme Court of Virginia from June 2014 through June 2015 addressing noteworthy civil procedure topics, amendments to the Rules of the Supreme Court of Virginia concerning procedural issues during the same period, and legislation enacted by the Virginia General Assembly during its 2015 session that relates to civil practice. This article surveys developments in Virginia criminal law and procedure from June 2014 through June 2015. Of the many judicial opinions and legislative enactments, the author has endeavored to select those with the most impact on the practice of criminal law in Virginia. While the 2014–2015 period brought relatively modest changes to election law, it saw substantial changes in Virginia’s ethics laws for legislators, other public officials, and lobbyists. This article surveys developments in Virginia election and government ethics laws for 2014 and 2015, with an emphasis on legislative developments. The focus is on those statutory developments that have significance or general applicability to the implementation of Virginia’s election and ethics laws. Consequently, not every election-related bill approved by the General Assembly is discussed. This article reviews significant recent developments in the laws affecting Virginia state and local taxation. Each section covers legislative activity, judicial decisions, and selected opinions from the Virginia Department of Taxation (the “Department”) and the Virginia Attorney General over the past year. 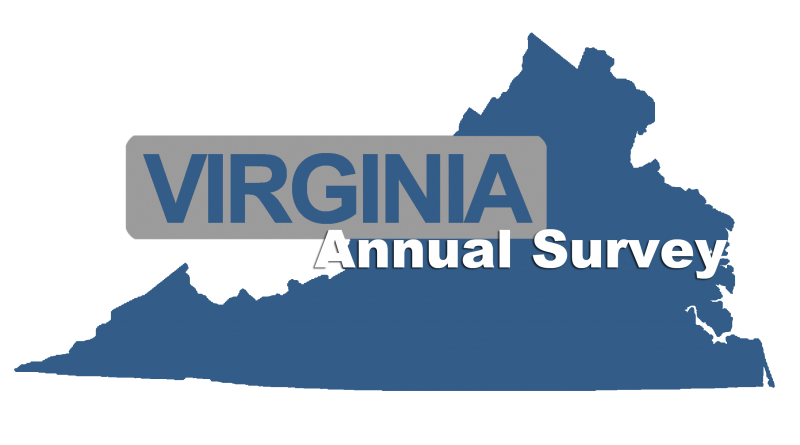 The inactivity of Virginia’s General Assembly and state courts in the area of wills, trusts, and estates, noted in this summary in 2014, continued this year. Legislation was generally limited to clarifications and technical corrections to existing laws on such subjects as creditor protection for certain trust assets, access to digital assets, qualification of personal representatives, and disposition of dead bodies. Three cases dealt with the doctrine of survivorship for administrators, interpretation of shareholder agreements, and the period for seeking removal of an executor. On June 2, 2015, the Supreme Court of Virginia convened a special session to celebrate the thirtieth anniversary of the Court of Appeals of Virginia. This anniversary affords the opportunity to look back on the court’s creation and to consider its evolution over the last three decades. Preliminary injunctive relief, where a movant is awarded a court order prior to final judgment on the merits of a dispute, serves a necessary role in equity jurisprudence. Courts typically state that preliminary relief is an extraordinary remedy designed to preserve the status quo, with some courts opining that this purpose simply describes the abstract goal of preliminary relief  and others holding that movants must satisfy a higher burden when seeking injunctions that alter the status quo. After significant evolution, federal courts developed a four-part test for preliminary injunctions, which the circuit courts of appeals have universally accepted but inconsistently applied. The Supreme Court of the United States subsequently resolved this circuit split in part, yet the circuit courts still adhere to different approaches when applying the test. On September 4, 2014, Governor Robert F. McDonnell and his wife, Maureen G. McDonnell, were convicted in federal court of various crimes related to their relationship with Jonnie Williams, a Virginia businessman, and his company Star Scientific. Earlier in the year, the McDonnells were charged in a fourteen-count indictment primarily consisting of public corruption charges. Governor McDonnell faced one count of conspiracy to commit honest-services wire fraud, three counts of honest-services wire fraud, one count of conspiracy to obtain property under color of official right, six counts of obtaining property under color of official right, and two counts of providing false statements, one on a financial statement and one on a loan application. Governor McDonnell was convicted on all counts except the two false statement charges. Mrs. McDonnell faced the same charges as Governor McDonnell, except she faced only one of the two false statement charges and was also charged with obstructing an official proceeding. On December 15, 2013, my wife and I welcomed a puppy into our family. We love dogs, grew up with them, but we had never raised one (or any living creature for that matter). As I drove to our Richmond Fan apartment from the foster home in Goochland, I felt helpless while he scratched at the carrier, frantic and screeching. During his first weeks with us, he smelled, relieved himself frequently and anywhere, and exhibited signs of abdominal distress that sent us on a trip to the companion animal equivalent of an emergency room.